Up until now, little has ever been revealed about the deeper history of the character. Whether this was intentional or not, I think the mystery behind Thanos and how he came to literally fall in love with death only added to his appeal. The possibilities that led him to such a point were many and the readers’ imagination was left to conjure them all. Therefore, if a writer/artist decides to offer a definitive answer that mystery—thereby obliterating all those wondrous prospects that previously existed in the readers’ collective imagination—he or she better have a damn good story idea. Framed this way, it sounds like a sucker’s bet, no? What are the odds that one explanation, one story idea, would be better than the myriad possibilities that ambiguity affords? Although I’ve only read the first issue of Thanos Rising, it’s clear that the series has already failed in this (admittedly Herculean) task. This is no surprise given the odds it was facing. What is most disappointing, however, is that it failed in the most hackneyed, boring, mundane way imaginable. For the newbies: Thanos first appeared in Iron Man #55, cover dated February 1973. The amazing thing about this issue is that Iron Man is rendered an incidental character in his own title. He plays a role in nearly all of the action scenes, but the meat of the tale is the introduction of not just Thanos, but an entire cast of characters that creator Jim Starlin would return to again and again over the course of his next four-plus years at Marvel. In addition to Thanos, we’re introduced to Mentor (his father), Eros (his brother), Kronos (his grandfather), Drax the Destroyer (his relentless pursuer), the Blood Brothers (his minions), and the setting of Titan (the moon of Saturn that serves as his family’s homeworld). That’s a lot for one issue. Still, we’re not given too many details about Thanos’s individual background outside of the fact that he’s an evil sort of space-god with aspirations of conquest that his family opposes. The Thanos thread is picked up again a month later in Captain Marvel #25, the issue where Starlin assumed creative control of the title. Thanos remains in the shadows here, not revealing himself to the Captain until the following issue, Captain Marvel #26. This issue is noteworthy because it marks the first appearance of Thanos’s mysterious companion. The figure is robed and hooded, covered from head to toe, with glowing eyes set against absolute blackness beneath the hood.And this companion will never utter a word, not a sound, until the very end of the storyline. The companion is by Thanos’s side constantly over the course of the next several issues, yet no one ever notes the companion’s presence—not even Thanos himself. Initially, one could even assume that the companion might not even be real; it may just be a mad delusion of Thanos’s that only he (and the readers) can see. The first hints we are given as to this companion’s identity and/or nature are maddeningly cryptic. Upon revealing himself in Captain Marvel #26, Thanos declares, “By the might of the legions I command—and recognizing death as my only comrade, I seized power on my homeworld Titan…” In retrospect, the meaning of these words is obvious, but on first read there’s no reason to believe the reference to death is anything but figurative. Thanos then has a brief soliloquy in #27 wherein he rhetorically asks, “But do I not flaunt the flame? Do I not embrace death?” Then in #28, he tells the Destroyer: “But now I’m forced to introduce you to the one you’ve cheated too often… DEATH!” These words appear in captions over a one-panel close-up of the face (still concealed in hooded blackness, save for those glowing eyes) of the companion. But again, the implications here are only obvious in hindsight. Finally, issue #31 brings some real revelations. 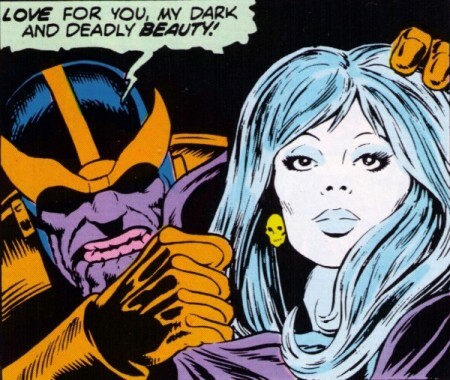 Not only do we see Thanos directly acknowledge his companion for the first time, but he actually pulls back the hood, revealing a beautiful woman with chalk-white skin, long flowing hair, and skull earrings. Thanos then reveals that all of his plans and machinations up to this point have served just one purpose: To win the love of this mysterious woman. At last, the means to defeat Thanos becomes clear. It’s the Cube. Although Thanos appeared to drain it of all its power, it is still what fuels him. The Captain destroys it, and seems to destroy Thanos in the process as well. As Thanos screams, his companion laughs—her once beautiful face becoming a grinning skull. Now we finally know: Thanos’s companion was death itself. He was literally courting death. After death gets her last laugh, there’s one page of story left in the issue. In a bit of genius, it contains no dialogue, just exposition in captions. Because, really, what is left for any of the characters to say in the wake of what they’ve seen and been through? The Destroyer silently departs, his very existence rendered meaningless without Thanos to pursue. Captain Marvel and the Avengers are then left just standing around looking at each other, apparently still absorbing and processing their collective experience. …Quite frankly, I need to take a mental break here just from writing about all of it! How epic was this? Let’s just briefly consider. Captain Marvel was being published on a bi-monthly schedule at the time. 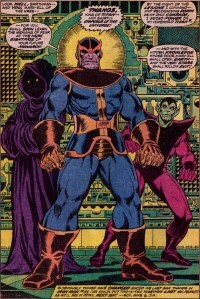 This initial Thanos storyline got its proper start in Captain Marvel #25, cover date March 1973; it was resolved in Captain Marvel #33, cover date July 1974. That’s sixteen months. For perspective, the Kree-Skrull War from the Avengers a couple years prior started in Avengers # 89 (June 1971) and concluded in Avengers #97 (March 1972). Also nine issues long, but released on a monthly schedule (or nearly so—they missed one month), so it was finished in nearly half the time. The only other comics epic I can recall that played out over a longer stretch of time than this Thanos saga was one starring that other Captain Marvel (of Fawcett fame), who spent two years (between 1943 and 1945) pursuing Mister Mind and his Monster Society of Evil in the pages of Captain Marvel Adventures, from issues 22–46. But even if there were other stories that could match (or exceed) its length, nothing could match the cosmic scale of this Thanos storyline. This was an antagonist who did not merely threaten Earth; he threatened all existence. And his motive was… love? What an incredible character. And what a deliciously dark tale this was; and an even more jaw-dropping, awe-inspiring conclusion. Can you imagine the suspense of waiting two months between installments? And nearly a year and a half between the start and the conclusion? It must have been one hell of a ride. So how, exactly, do you screw up a character as grand as Thanos? I’ll get to that (along with further analysis of Starlin’s classic work) next time.